One of the 32 quipu. from the graves of Laguna de los Cóndores. Camelid fiber. Museo de Leymebamba, INC- CMA 0847A. Photo, Yutaka Yochii. Laguna de los Cóndores, Chachapoyas Region, Perú. Photo, taken from G. Urton, 2003. The vast majority of all quipu samples in museum collections derive from grave sites along the dry coasts of Peru or Chile. However, a discovery of some 32 new samples from a site in the north highlands of Peru, in the area of Chachapoyas, represents an important group of samples from a heretofore little known region of quipu recordkeeping. The Chachapoyas seem to have been an ethnic confederation of highland and lowland peoples in northern Peru whose home territory was between the Marañon and Huallaga rivers, in the present day Department of Amazonas, Peru. The Chachapoyas were among the last peoples to be conquered by the Inkas and incorporated into the empire during the last half century before the Spanish conquest. 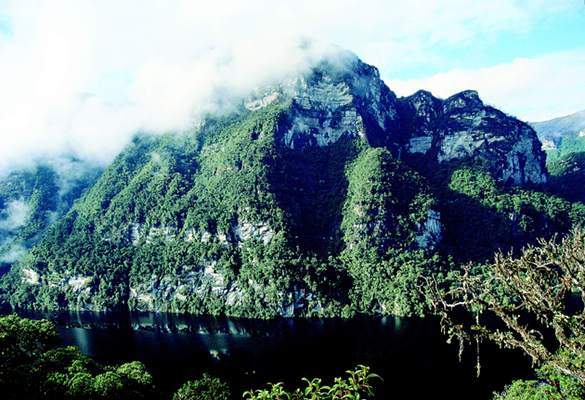 In 1996, a group of workmen who were logging near the site of Laguna de los Cóndores noticed a number of small house-type constructions built into a rock overhang in the cliff face high above the lake. Making their way to the site, the workmen encountered a half dozen stone and mortar burial houses (chullpas) inside of which they found some 225 mummy bundles. The intruders sacked and looted the chullpas for a period of several weeks before the authorities heard of the discovery and moved in to establish control over the site. In addition to the mummy bundles and quipus, cultural remains at Laguna de los Cóndores included wooden sculptures, pottery, pyroengraved gourds and a variety of other objects of Chachapoyas, Chachapoyas-Inka, and even early colonial manufacture. Responsibility for the rescue and preservation of the cultural materials from Laguna de los Cóndores fell to the Peruvian physical anthropologist, Dr. Sonia Guillén. Guillén and her colleague, Adriana von Hagen, mounted an archaeological salvage operation, which resulted in the removal of the material to the nearby town of Leymebamba. Subsequent work has involved stabilizing the looted and badly disturbed materials, as well as overseeing the beginnings of scientific study of the collection. Study of the quipu collection began in 1998 under the direction of Dr. Gary Urton. Quipus from this collection included numerous samples bearing several hundreds of pendant strings. One of the most interesting and potentially important samples in the collection is a cotton quipu bearing 762 pendant strings. 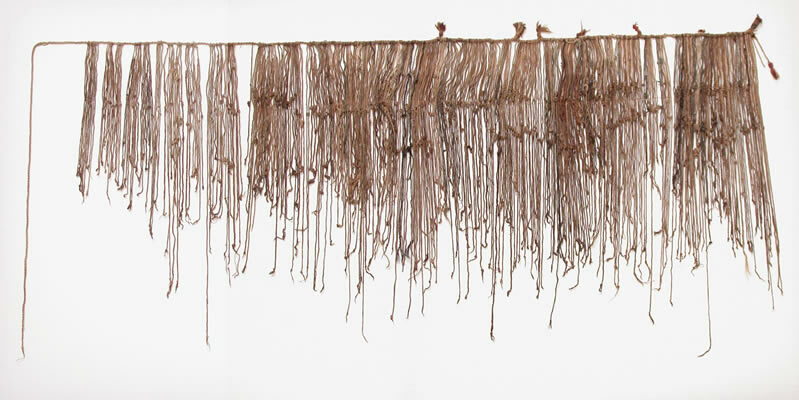 The majority (i.e., 730) of the pendant strings of this quipu are organized in a manner that has been shown to have probably been intended for use as a two-year calendar system. That is, the 730 strings are organized in 24 groups of approximately 30 strings per group to produce two sections having counts close to the number of days in two years — 365+365=730 days. As laid out on the quipu in question, the two recording periods included one group of 362 strings and another of 368 strings (= 730 strings total). It has also been suggested that this hypothetical calendrical quipu may have represented the temporal framework for accounting for the labor tribute of the 3,000 tribute payers — divided into three groups of 1,000 (waranqa) tribute payers — in the central Chachapoyas region. Early Spanish colonial documents from Chachapoyas attest to this particular count and organization of tributaries in central Chachapoyas during the final years of the Inka Empire. Thus, the new collection of quipus from Laguna de los Cóndores may open up a new avenue of study of these devices by allowing researchers to compare testimony recorded on quipus with information written down in the earliest Spanish documents from this region of northern Peru.